Mumbai, March 25: With the Model Code of Conduct for Lok Sabha elections 2019 in place, Vivek Oberoi-starrer Bollywood movie on Prime Minister Narendra Modi is in the soup again. 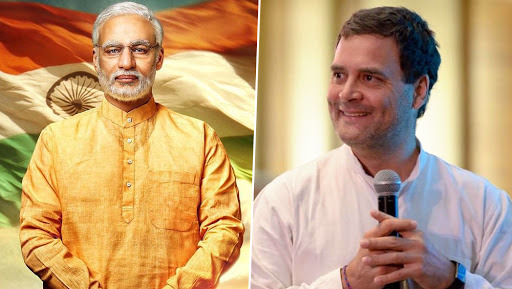 On Monday, Congress moved the Election Commission (EC) to get the release of the biopic movie – ‘PM Narendra Modi’ – deferred till the final phase voting in the Lok Sabha polls, i.e. May 19. Earlier, even the DMK has written to the Election Commission and asked for a stay on the movie. As the date for the release of the movie has been announced on April 5, and the first phase of Lok Sabha Elections begins from April 11, political parties believe that this is a violation of Model Code of Conduct and Election Commission should look into the matter seriously. Congress even claim that this movie might influence the voters who are deciding whom to choose as their representative government in the Centre. PM Narendra Modi Biopic Controversy: After Javed Akhtar, Lyricist Sameer Is Shocked To Find His Name On Vivek Oberoi’s Film's Poster. Earlier, DMK’s PS Arasu Bupathi had written to the Chief Election Commissioner, the Chief Electoral Officer and the State Election Commissioner, and asked them to postpone the release of the biopic on Prime Minister Narendra Modi. Echoing similar tone, Maharashtra Navnirman Sena's general secretary Shalini Thackeray had sought a ban on the release of the Narendra Modi biopic. She was of the opinion that even films like 'Toilet Ek Prem Katha' and 'Padman' were released during the party's Gudi Padwa meeting last year, which promoted BJP had sponsored schemes. It is to be known that the Model Code of Conduct for the Lok Sabha Elections came into effect on March 10 and would continue till May 23, until the counting of votes is over. The Lok Sabha Elections will take place across the nation in seven phases, beginning from April 11 and would conclude on May 19.